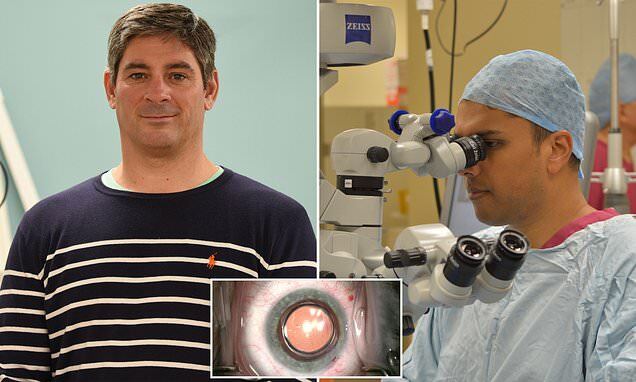 A lawyer has become the first patient in the UK to undergo a ‘miracle’ eye operation that means he can see clearly after years of wearing glasses. Patrick Higgins, from Surrey, had a type of permanent contact lens inserted into his eye. And unlike in previous procedures, the close-vision lens can be easily removed if it causes side effects like light glare, leaving the patient with their long vision still corrected. The 10-minute procedure combines this revolutionary new lens with traditional cataract surgery to correct both long and short-sightedness in one go. The company pioneering the operation says the scientific advance 'could help millions of people' as an alternative to laser eye surgery. Mr Higgins underwent the operation at The Spire Hospital in Portsmouth on October 30 and says he hasn't needed glasses since. His surgeon, Rakesh Jayaswal of LaserVision, replaced the lens at the back of Mr Higgins's eye – as in a normal lens replacement operation – because he was developing the early signs of a cataract. This corrected Mr Higgins's long-distance vision, but many people who have cataracts still need to use reading glasses after their treatment. But the new procedure, called Trifocal DUET surgery, adds a second new lens inside the front of the eye – similar to a contact lens – to correct close vision as well. And the same lenses can be added into the eyes of people who have already had standard cataract surgery and want to do away with reading glasses. 'I was operated on in the evening and as soon as I woke up the following morning, the world was a different place,' Mr Higgins told MailOnline. Niccolò dell’Arca’s Lament for the Dead Christ “God is dead and we have killed him.” Nietzsche is right once a year.